The picture can be attributed to the cycle of peasants, which is one of the best works of the artist. Before the viewer appears a symbolic portrait of a man. Malevich in his work sought to develop the boundaries of traditional art. The cycle “Peasants” should have been presented as a graphic depiction of everyday life, all the difficulties and hardships of the low class. The more the artist learned the tradition of the people, the more he sought to draw public attention to the needs of the peasants, but not through pity, but their strength of mind. Red color initially embodies the hard work of people, internal struggle and conflicts with the highest ranks. A reddish brown tint reveals a connection to the ground. Immediately there is an association with work on arable land, folk fertility rites. The background is a green color, which harmonizes the soul of man with nature. The proximity of the peasant to her, the natural beauty of both physical and spiritual. 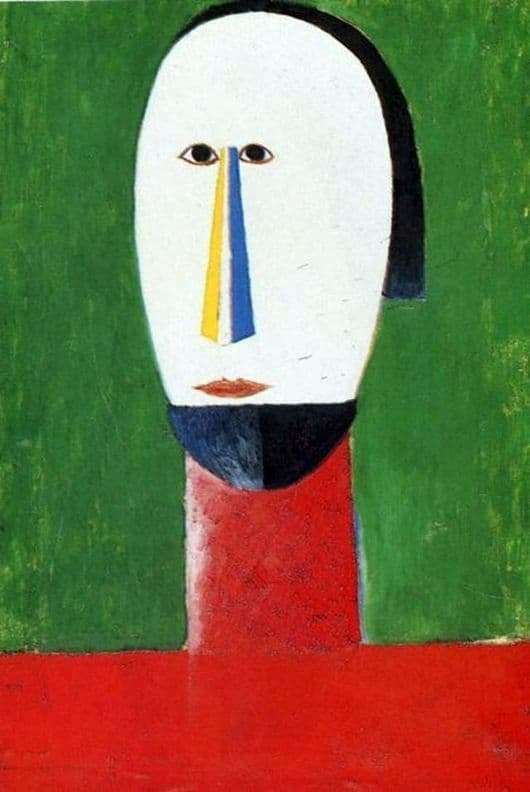 Geometrically located nose with three colors, shows the diversity of nature, which is exposed as the yellow color of pain, blue – purity and unusual, white in the middle – harmony. The presence of a black tint reveals the doubts that exist in each person. It also expresses a short life and high mortality due to the lack of drugs for the disease. Meeting with heavy obstacles to self-realization and self-development. Black and white are evenly distributed in the picture, which creates Yin-Yang Asian symbolism. Wide forehead and close eye location depicts a person who is not engaged in high sciences, but is working hard for the benefit of the family and society. A high neck, stretching upward, shows a desire for something new and a willingness to know the world.